Total RNA extraction technology in combined with automation offers researchers a true walk-away process for consistent recovery of high quality total RNA in a multi-well format. Utilizing patented Agencourt SPRI (Solid Phase Reversible Immobilization) paramagnetic bead-based technology, the RNAdvance Tissue Kit extracts total RNA from a wide variety of tissues without the hazards and waste removal issues of organic solvents. Time-consuming and labor-intensive steps, such as vacuum filtration and centrifugation, are eliminated. 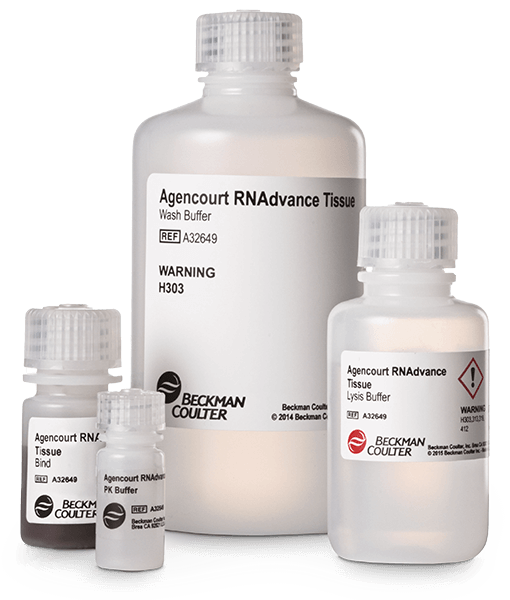 The RNAdvance Tissue Kit produces high recovery of total RNA from soft, fibrous and lipid-rich tissues.